Bah ha ha! You gotta!! Otherwise you'll be spending your time nibbling mushrooms. Lol, the spaghetti eating made me laugh. That is epic. Again, awesome artwork and you're quick with these! Freed before breakfast? Didn't he just HAVE breakfast? He did, but did Peach have any? D'OHOHO! Plumbers be hungrrrrry! ....Your profile pic makes me laugh so hard! Love it! Eh, midnight snack or dinner leftovers would be closer to the mark I bet. I bet Mario is totally the type to say "Once and for all" EVERYTIME he goes after Bowser, only for Bowser to pull something again two weeks later! 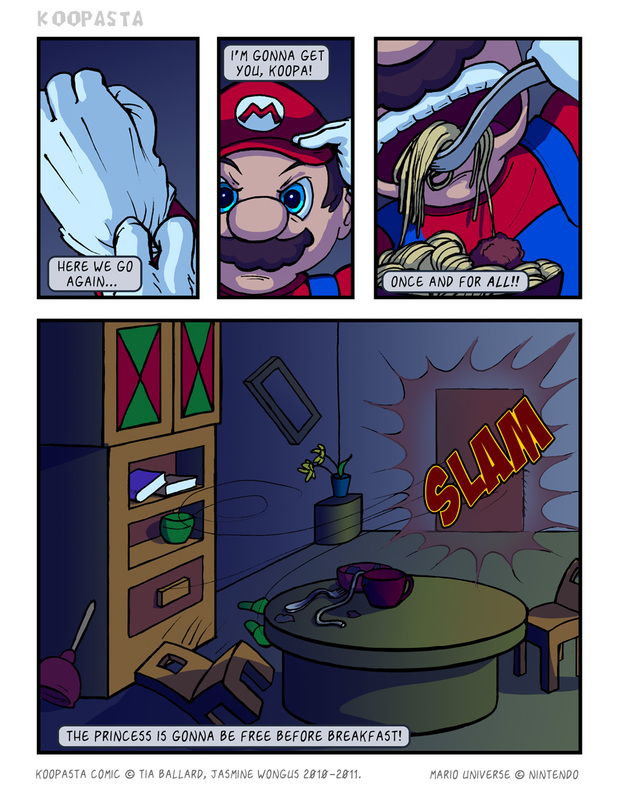 Poor Mario. Always so hopeful. Always. Bah ha ha!! That's how great Bowser is. For all his narcissism shown in the games, it's true that he's THE final boss who's powerful enough to give Mario time and time again.